Each year a relatively unknown but spectacular event occurs underwater off the Dorset, Hampshire and Sussex coasts and maybe even beyond. 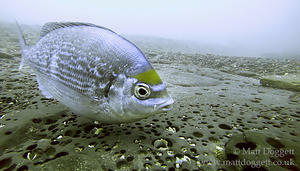 Tens of thousands of black bream arrive in spring on their annual spawning migration. The fish are essentially ecosystem engineers, changing the seabed to a lunar-like landscape of craters over vast areas as the hard-working male fish dig out the sand / gravel / shells to reach the bedrock below. Swimming proudly over their new creations, a male fish will entice female bream to the nest and if an inspection by the female proves successful she will spawn, attaching her eggs to the exposed rock. The male bream then guards and cares for the eggs until they have hatched. Our work is probably the first to make detailed behavioural and temporal records of this event in the field with most previous knowledge being sourced from aquarium records or inferred from side-scan sonar data and fishing records. Come and discover more about the remarkable breeding antics of this territorial yet shy fish, find out how we are capturing the footage and how our data are proving to be of use for both conservation and fishery advice. Dr Matt Doggett is a freelance marine biologist and natural history photographer based in Southampton. Having completed his PhD at Bangor University, he has worked in the Philippines on reef conservation projects and then for a consultancy firm based in Southampton. Now freelance Matt’s work involves carrying out and reporting on scientific diving, fishing and benthic surveys, advising industry on possible impacts and mitigation options, sustainable fisheries assessments and natural history photography. Matt’s underwater photography has seen him published in books, newspapers and magazines worldwide and won him top accolades as British Wildlife Photographer of the year in 2012 and British Underwater Photographer of the Year in 2015 with numerous other Highly Commended placings in national and international competitions. Matt has been working on the Black Bream Project since 2013 with friends Martin and Sheilah Openshaw. These talks are held on the first Thursday of each month at 7.30pm in the Henry Charnock Lecture Theatre, National Oceanography Centre. Please sign in outside the lecture theatre on level four. These talks are accessible via stairs or a lift. Since the lift cannot be used in an emergency, evacuation of less able visitors is down the stairs via an evacuation chair. Please notify us in advance of the presence of a wheelchair user or anyone with access issues likely to require the use of an evacuation chair. – Tel: 023 8059 6100 or subscribe to NOCMAIL to receive FREE email updates and alerts for future Marine Life Talks and other marine related topics.